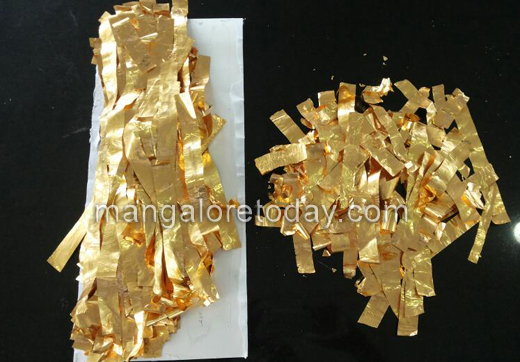 Mangalore, Sep 11, 2014: The officers of customs at Mangalore International Airport on Wednesday seized over 1.3 kg of gold valued at Rs 38.31 lac in 2 separate cases. 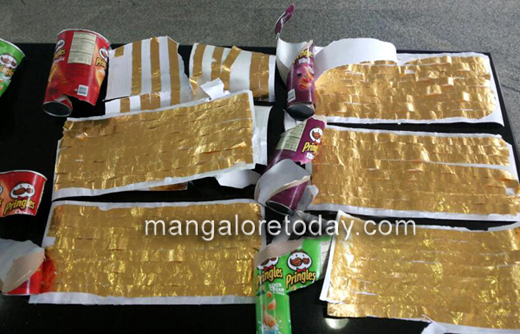 In the first case, the officers seized gold in the form of foil strips, totally weighing 709.6 grams and valued at Rs 19,51,400, covered in cardboards containing toys and stickers fixed to them, and around the walls of potato wafers tins, which were kept and brought in checked-in baggage. 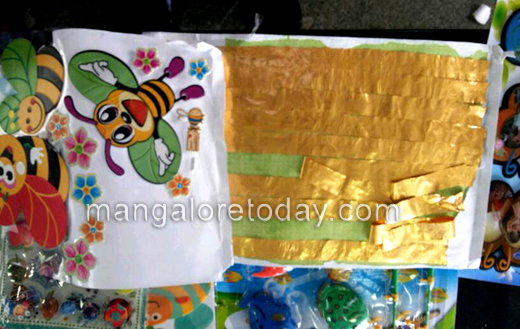 The gold was seized from a passenger identified as Athiyalparambu Kunhabdulla (39), a resident of Kolavayal in Kasargod. He arrived at the airport on Wednesday at 7.45 am by Jet Airways flight from Dubai. In a similar case on the same day, the officers seized gold in the form of foil strips, totally weighing 683.6 grams and valued at Rs 18,79,900, covered in cardboards containing toys and stickers fixed to them, and around the walls of potato wafers tins, which were kept and brought in checked-in baggage. The gold was seized from Eachilingal Kunhamoo Moosa (32), a resident of Uduma in Kasargod, who arrived at Mangalore International Airport on Wednesday by the same Jet Airways flight from Dubai. Altogether, the customs officials seized 1,393.2 grams of gold valued at Rs 38,31,300. The operations were conducted under the supervision of Krishna Kumar Prasad, deputy commissioner of customs, Mangalore International Airport. Further investigations is under progress.